A group of underprivileged women living in Pally Mangal in south Kolkata have the opportunity to learn new a skill and earn an income. St Xavier’s College, a Roman Catholic institution in Kolkata, runs a project called Enactus which supports livelihood programmes for slum women. They have identified CRS as suitable partner organisation and started a new initiative. 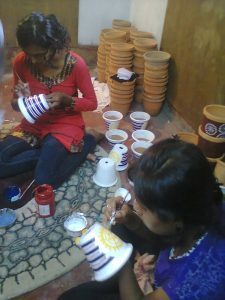 Undergraduate students from the college are training women to paint clay pots with attractive and colourful designs which can then be sold on the open market. A group of five young women from Pally Mangal have been selected for this training and are already showing great potential.